Our economy is strongest when people have money to spend. But when people who work full time still don’t earn enough money to cover the basics, our economy is not at its healthiest. Tax credits for low- and moderate-income working families are a common-sense way to spur economic activity and put money in the hands of consumers who will spend it. When we increase the income of hard-working New Mexicans through tax credits, we all win. Tax credits can improve well-being by increasing opportunities to thrive and enhancing physical and mental health. When families and children have better physical and mental health, we become a stronger state. Tax credits are also a cost-effective and non-stigmatizing way to help hard-working, low-income families get ahead. In New Mexico, the Working Families Tax Credit (WFTC) is one of the most sensible parts of our tax code: it encourages work, helps to raise hard-working families out of poverty, and benefits 225,000 New Mexico children, while also pumping millions of dollars back into local communities. Currently worth 10 percent of the federal Earned Income Tax Credit (EITC), the WFTC is lower than the national average for such credits and should be raised to 15 or 20 percent. In addition, the state should: expand outreach efforts and low-cost tax preparation assistance; restrict the use of refund anticipation loans; support federal efforts to increase the EITC for childless workers; and consider disbursing the refund through periodic payments over the course of the year. Increasing the WFTC and making these other changes would be a smart investment in New Mexico’s businesses, and our working families’ income, health, and future. The EITC and the WFTC reduce poverty in two ways: through the short-term and more immediate impact of the credit itself and through the more long-term increases in family earnings, which can provide lasting benefits for children. These benefits are multi-generational because they stick with children as they enter adulthood, which in turn supports healthy social and physical development of their own children and the economic development of our state. For workers who qualify for the credit,3 their income, marital or filing status, and the number of dependent children they claim determine the amount of the credit they receive (see Figure I). For tax year 2018, working parents who have incomes of up to $40,320 (for a single parent with one child) and $54,884 (for a married couple with three or more children) can receive the credits. Workers with no children qualify if they earn no more than $15,270 (or $20,950, if married and filing jointly). 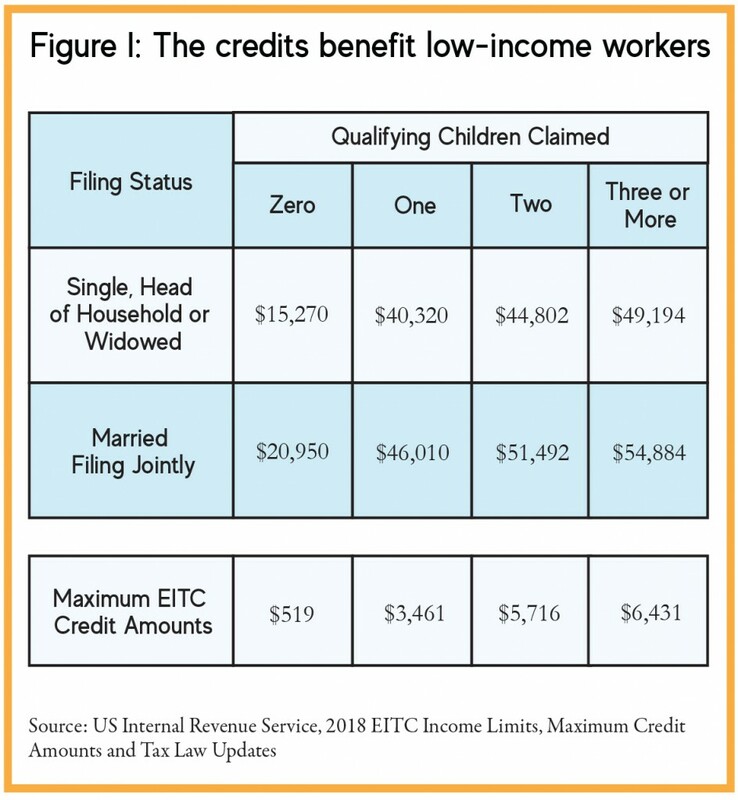 The value of the refunds ranges between maximums of $519 (with no children) and $6,431 (with three or more children) for the EITC and $52 to $643 for the WFTC. The refund amounts increase as earned income increases until a maximum level is reached, at which point the credits plateau and then phase out. In 2018, the EITC reached nearly 26 million families nationwide. Research shows that in 2016, this tax credit lifted about 5.8 million families with approximately 3 million children out of poverty.4 Furthermore, the EITC reduced the severity of poverty for 18.7 million people, which benefited nearly 6.9 million children. 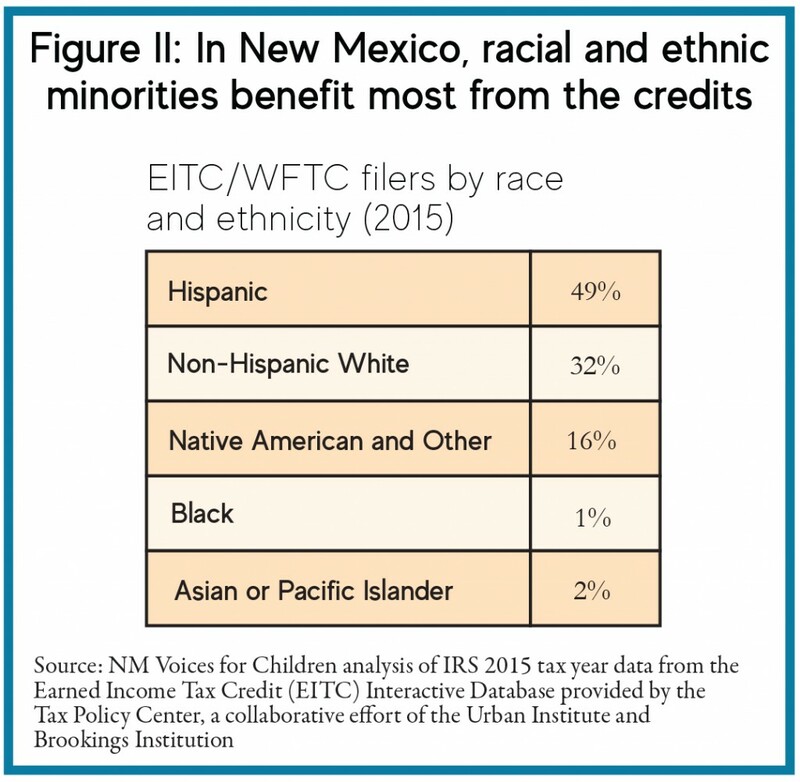 The majority of the 210,000 working New Mexicans who claim the EITC and WFTC every year are racial or ethnic minorities; 49 percent are Hispanic, 19 percent are Native American and other people of color, and 32 percent are non-Hispanic White (see Figure II). These filers have a median income of $14,018.6 The credits help most of these workers through tough – but temporary – economic troubles, such as a job loss or the birth of a child. In fact, three out of five workers claim the credits for only one or two years7 (see Figure III). As a group, those who claim the EITC and WFTC pay a large share of their incomes in taxes. In fact, in addition to the federal payroll taxes they pay, New Mexico’s lowest-income households pay a larger share of their income in state and local taxes than the households in every other income group. Those making less than $17,000 a year pay more than 10 percent of their incomes in state and local taxes. 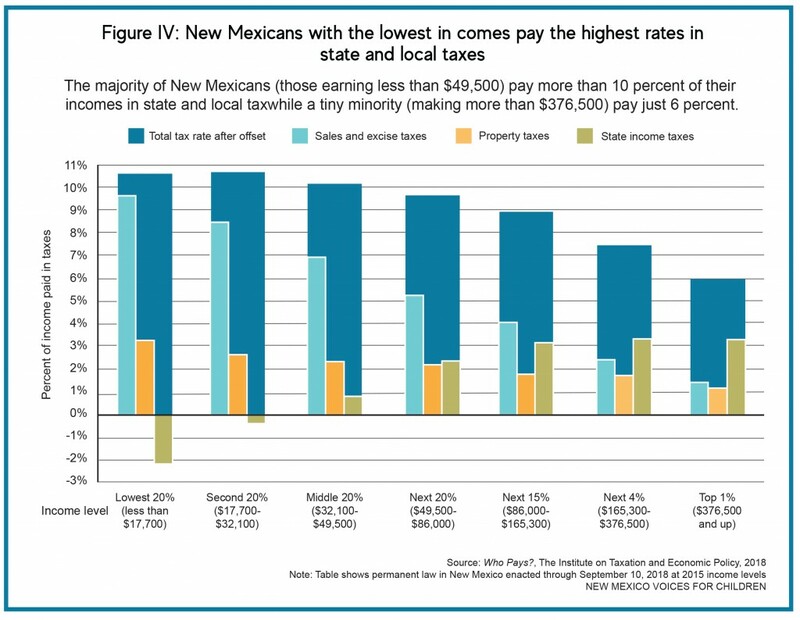 Meanwhile, New Mexicans who make more than $370,000 pay 6 percent of their incomes in those same taxes12 (see Figure IV). The lowest-income New Mexican taxpayers, therefore, are paying nearly twice the portion of their incomes in state and local taxes than are the richest New Mexicans. This huge disparity exists even after the current value of the EITC and WFTC are taken into account. Many types of occupations and industries are represented among EITC/WFTC-eligible tax claimants. The occupations that have the highest shares of EITC/WFTC filers are office and administrative work, sales, personal care workers, service occupations, and management occupations (see Figure V). The health care, retail trade, accommodation and food service, education, and construction sectors are the industries with the highest shares of workers who claim the credits (see Figure VI). Tax credits for workers in these industries help make up for what are often very low wages and, in doing so, directly help support the businesses in these industries. 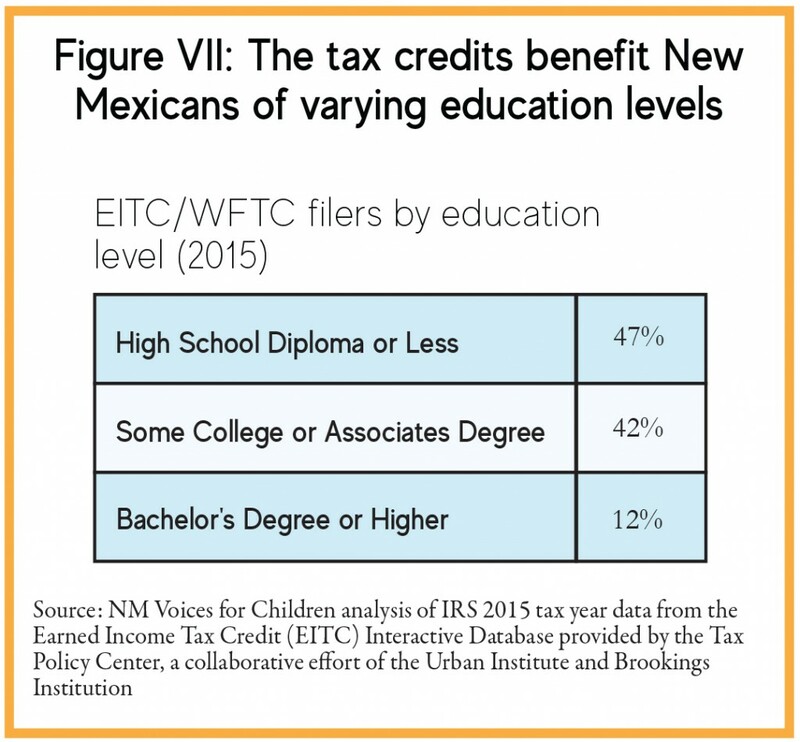 Both New Mexicans with some higher education and those with limited educations benefit from the EITC and the WFTC. While nearly half (47 percent) of filers have a high school diploma or less, more than half have at least some college, and 12 percent of claimants have a bachelor’s degree or higher (see Figure VII). New Mexico also has one of the highest rates of income inequality in the nation – meaning there is a large gap between what the lowest-income New Mexicans earn and what the highest-income New Mexicans earn.17 Income inequality puts our economy out of balance in part because too much income is concentrated into too few hands where it is less likely to be spent. Growing income inequality is especially destructive in New Mexico because while the rest of the nation has already bounced back from the Great Recession, New Mexico’s recovery is only now beginning to pick up. Economic recoveries happen more quickly when increases in income and employment are broadly shared and spread across all income levels. However, in contrast with historical economic recoveries, income and employment recoveries of the last recession have taken longer to reach low- and middle-income earners, especially in New Mexico. As the gap between the wealthiest and the poorest gets bigger, gains – including recession recovery gains – go very disproportionately to the richest. Tax credits like the EITC and WFTC that target benefits to low-income workers give these hard-working families a hand-up while helping to limit the growing gap in income inequality. The EITC and WFTC not only help increase workers’ incomes, but they also help low-income families continue to participate in the workforce because they help pay for necessities like child care, transportation, and education or job training programs. This is good for businesses because workers who can pay for these basic needs are more reliable employees. Families earning very low wages see larger refunds as their incomes rise, which encourages them to work more hours. Extensive research shows that the EITC has been successful at encouraging and increasing work, especially among single parents, and particularly among single mothers.18 Increased work and earnings among low-income families has the effect, in turn, of reducing dependence on public assistance and shrinking Temporary Assistance for Needy Families (TANF, the program formerly known as welfare) caseloads. Workers who receive credits like the EITC and WFTC also boost their Social Security earnings and retirement benefits, which can help reduce the incidence or severity of poverty in old age.19 Research shows that the EITC increases employment and reduces the need for public assistance across generations. In addition to significant health benefits, children in families that receive the EITC and WFTC also see improvements in educational outcomes. Mothers who receive the EITC read to their children more frequently and assist their children more frequently with homework.20 The younger the children are at receipt of these tax credits, the better the academic and economic outcomes are. Earlier access to EITC leads to better school performance among elementary and middle school students21, 22 but benefits are also seen if the tax credit is received later in adolescence. The EITC and WFTC are also good for business because they are good for the state’s economy. 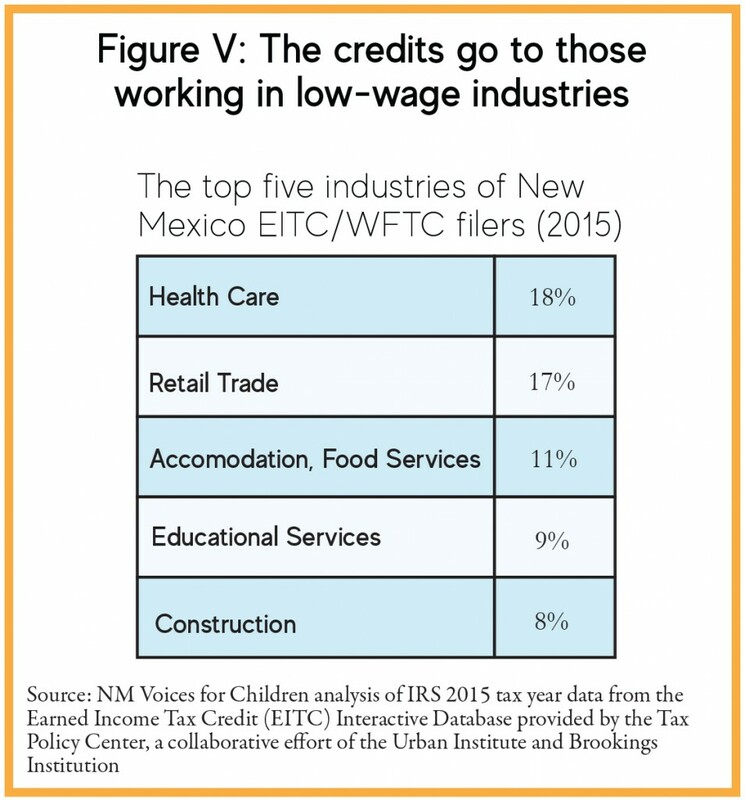 Last year alone, New Mexico’s low-wage workers received more than $570 million from the EITC and WFTC combined – much of which was pumped right back into the economy through rent payments, purchases of groceries and other household necessities, and to pay for child care. Research shows that EITC households spend their credits quickly and locally, and that local economies benefit as a result. Economists categorize the economic impacts of injections of money into an economy (in this case, federal EITC money into New Mexico’s economy) as the sum of: direct impacts (EITC recipients spending their refunds); indirect impacts (businesses spending more in response to EITC spending at those businesses); and induced impacts (changes in spending patterns caused by direct and indirect impacts). Social and economic conditions are critical determinants of both individual health and population health,36 but the health impacts of economic policies that shape the distribution of income and wealth are often overlooked. A growing body of literature shows that economic policies contribute both directly and indirectly to health. We know today that economic policies that directly target working-class families can improve population health more than policies that target the rich or the population overall.37 Policy levers that create opportunities and eliminate barriers in order to achieve health equity include the Medicaid expansion, laws to increase the minimum wage, state-funded pre-K, and housing assistance programs.Tax policies are also important health drivers. For example, increased tax revenues that leads to investments in infrastructure, such as mass transit, can improve the health and well-being of our communities. But in the current research connecting tax policy to health, the tax policy that looms largest and is most often linked to health is the EITC – and research suggests that the size of the credit impacts the extent of the improvement. Research shows that the health benefits for children of the EITC begin in infancy.38, 39 A large body of research40 documents a positive relationship between increased EITC income and improved birth weights. On average, every $1,000 of EITC income is associated with a 7 percent decrease in the likelihood of babies being born at a low weight. Increases in the EITC have also been linked with increased likelihood for prenatal care, and decreased maternal smoking and drinking during pregnancy.41 The more generous these tax credits are, the more likely it is that smoking rates are reduced, maternal mental health is improved, and low-birthweight rates are decreased, among other improved health outcomes in families receiving the EITC. The tax credit also is associated with increased private health insurance coverage for children ages 6 to 14.42 Lifting the income of families of limited means when a child is young not only tends to improve children’s immediate health insurance coverage and access to health services, but is also associated with an increased likelihood of additional training and/or schooling, which is also linked to improved health outcomes. to improved long-term health benefits. More and more, researchers are investigating and articulating the connections between tax policies – including tax credits – and health.50 If expanded, the WFTC has the potential to have a greater impact on the next generation of children, thereby breaking the cycle of poverty. This policy is one of the few that have resulted in documented positive effects at all stages of life. Evidence suggests that the federal and state-level EITCs are particularly effective at reducing poverty among households of color and among women.51 This is important in New Mexico, where people of color and women are more likely to live in poverty than their White and male peers. Children of color – who make up the majority (75 percent) of the state’s child population – are even more likely to face troubling economic conditions. In New Mexico, 30 percent of Hispanic children and 42 percent of Native American children live in poverty compared to 13 percent of non-Hispanic White children.52 Consequently, children of color are more likely to see the greatest benefits from the EITC and WFTC because they are the most likely recipients of the credits. As noted previously in the report, 52 percent of EITC and WFTC recipients in New Mexico are Hispanic and nearly 16 percent are Native American. The EITC and WFTC can reduce poverty in families of color by alleviating high housing costs, for example. A larger portion of the income of families of color goes to housing costs, which limits the family’s ability to cover other necessities such as food, health care, and transportation. Nationally in 2016, 45 percent of African American and 43 percent of Hispanic children – compared to 23 percent of White children – lived in households with a high housing cost burden. New Mexico is ranked 35th in affordable housing as compared to the rest of the states.53 Increases in income through the EITC and WFTC can help families of color in our state address housing costs. The EITC and WFTC also address racial and ethnic inequity by assisting children who are more likely to be at an educational and health disadvantage compared to their higher-income peers54 and increase opportunities for a better future among low-income families and children of color who often face much greater economic and health challenges. Credits like the EITC and WFTC are some of the best options to close those economic and health gaps. Preparing for America’s future requires us to ensure that we support all contributing members of our communities – no matter where they live, their gender, their racial and ethnic backgrounds, or how much their parents earn. The overpayment rate does not fully account for corresponding underpayments. For example, if a father mistakenly claims an EITC for a child that lives with the mother, the full amount is counted as an overpayment but the amount unclaimed by the eligible mother is not taken into account. Overpayment estimates are based on 2009 data, and do not reflect the significant additional enforcement measures the IRS has implemented since then. The EITC rate of noncompliance is substantially lower than the rate in a number of other parts of the tax code, and accounts for a very small share (less than 3 percent) of the estimated $450 billion tax compliance gap. More than 80 percent of EITC claims are now filed electronically, better enabling the IRS to identify questionable EITC claims before paying them. A powerful IRS database identifies questionable EITC claims, targeting nearly 500,000 claims annually for examination. The IRS is implementing rules to require preparers to register and pass a competency exam that promises to be a major step forward. In 2013, the IRS identified 7,000 preparers with high error rates in the EITC claims they filed. It carried out a range of interventions with these preparers before and during the 2013 filing season, including educational visits by IRS agents. Overall, this strateg y alone averted an estimated $590 million in erroneous claims, according to the IRS. Evidence that New Mexico’s Working Families Tax Credit (WFTC) helps working families and spurs the economy is abundant. The Earned Income Tax Credit (EITC) also enhances the health and well-being of families and children in our state. However, the credit could do even more and have a bigger positive impact in our state with some improvements. Increase the value of the WFTC: At 10 percent, New Mexico’s WFTC is below the national average among states that have a similar EITC-based tax credit (see Appendix A). Lawmakers should increase the credit from 10 percent to at least 15 percent of the federal Earned Income Tax Credit. Raising the credit to 15 percent of the EITC would mean investing $26 million more in our economy and our hard-working, low-income families. This practical investment will make a big difference for New Mexico families struggling to get by on low wages. 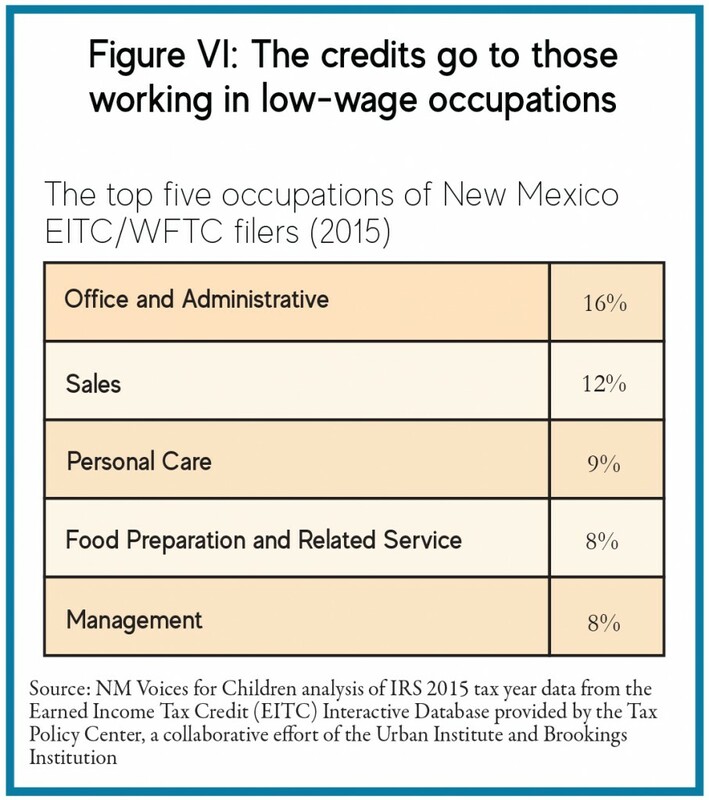 Expand outreach efforts and tax preparation assistance: One in five eligible workers in New Mexico misses out on the EITC and WFTC, either because they don’t claim it when filing, or they don’t file a return. Tax assistance programs – such as the United Way and CNM’s Tax Help New Mexico program – that provide free (and bilingual) tax preparation for low-income New Mexicans are great models for tax preparation outreach. Lawmakers should expand outreach efforts like these and support free or low-cost tax preparation assistance in order to maximize the benefit of the credit. Expanding access to volunteer tax preparation services and free online tax filing would preserve more of the credits’ value for those filers that might otherwise face significant tax preparation fees or be pressured to buy costly refund products that eat up a large part of the credits, blunting their otherwise positive impacts. Additionally, due to the proven economic benefits of the EITC, expanding participation among eligible filers would increase transfer payments and benefit New Mexico’s economy. Both RALs and RACs disproportionately harm EITC and WFTC tax filers and can siphon off much of the value of the credits that is intended to help low-wage workers. New Mexico should limit the rate that can be charged on these refund options, mandate and standardize disclosure and marketing practices, and strictly enforce compliance among lenders. Quoted by Lea Donosky in “Sweeping Tax Overhaul Now The Law,” Chicago Tribune, October 23, 1986. Gagnon, D., Mattingly, M., and Schaefer, A. 2017. State EITC Programs Provide Important Relief to Families in Need. Carsey Research National Issue Brief #115. EITC qualifications include: having earned income from things like wages, salaries, disability pay, and profits from owning your own business; being a U.S. citizen or resident alien for the entire tax year; having a valid Social Security number for everyone on the tax return; and not having income investments over $3,500. The Earned Income Tax Credit. April 2018. Center on Budget and Policy Priorities (CBPP) Policy Basics. 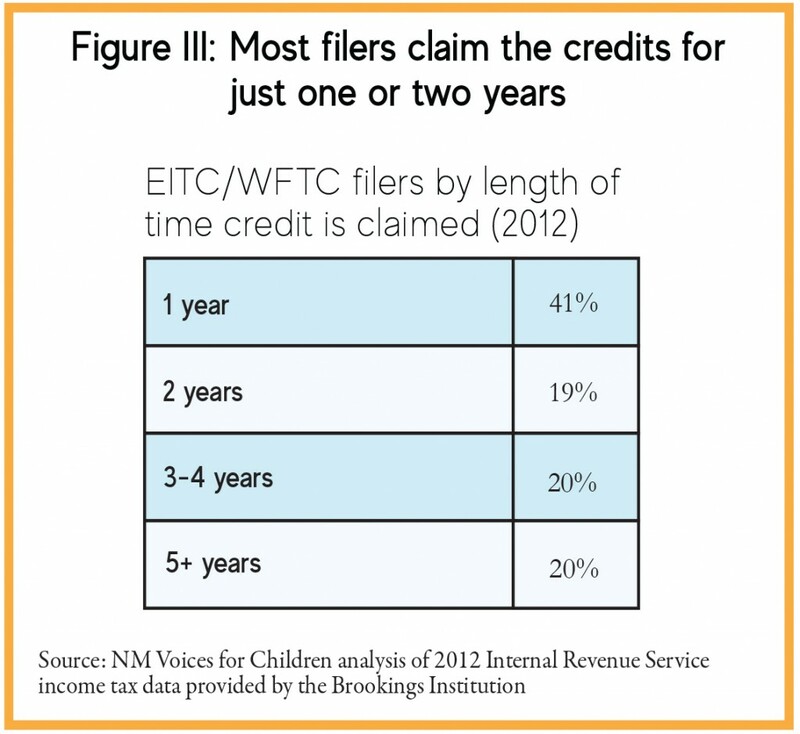 NM Voices for Children analysis of IRS 2015 tax year data from the Earned Income Tax Credit (EITC) Interactive Database provided by the Tax Policy Center, a collaborative effort of the Urban Institute and Brookings Institution. Dowd, T., and Horowitz, J. 2011. “Income Mobility and the Earned Income Tax Credit: Short-Term Safety Net or Long-Term Income Support,” Public Finance Review. CBPP analysis of 2009-2012 American Community Survey data. KIDS COUNT Data Book. 2018. Annie E. Casey Foundation. Two Generation Approaches to Poverty Reduction and the EITC. 2015. Grantmakers Income Security Taskforce. The Earned Income Tax Credit. April 2018. CBPP Policy Basics. Who Pays? A Distributional Analysis of the Tax Systems in All 50 States. October 2018. Institute on Taxation and Economic Policy. U.S. Census Bureau, American Community Survey data, 2017. Brookings Institution analysis of 2011 tax year data. US Census Bureau, American Community Survey data, 2017. Conditions of Low-Income Working Families in the States. Working Poor Families Project (WPFP), Population Reference Bureau analysis of U.S. Census American Community Survey data, 2016. On the Gini Coefficient measure, NM is 40th; on shares of income by quintile, NM is 44th. US Census, American Community Survey, 2014 data (1st being the best ranking a state can have, 50th being the worst ranking ). Eissa, N., and Hoynes, H. 2006. Behavioral Responses to Taxes: Lessons from the EITC and Labor Supply. National Bureau of Economic Research (NBER). Averett, S., and Wang, Y. July 2015. The Effects of the Earned Income Tax Credits on Children’s Health, Quality of Home Environment, and Non-Cognitive Skills. IZA Discussion Paper Series No 9171. Duncan, G., Morris, P., and Rodrigues, C. 2011. “Does Money Really Matter? Estimating Impacts of Family Income on Young Children’s Achievement with Data from Random Assignment Experiments.” Developmental Psychology 1263-1279. Dahl, G., and Lochner, L. 2012. “The impact of family income on child achievement: Evidence from the Earned Income Tax Credit.” The American Economic Review 102(5): 1927-1956. Manoli, D., and Nicholas, T. January 2014. Cash On Hand and College Enrollment: Evidence from Population Tax Data and Policy Nonlinearities. NBER. Working Paper 19836. Thomas, P.W. November 2017. Childhood Family Income and Adult Outcomes; Evidence from the EITC. Purdue University. EITC and Child Tax Credit Promote Work, Reduce Poverty, and Support Children’s Development, Research Finds, CBPP, revised in 2015. Duncan, G., Ziol-Guest, K., and Kalil, A. 2010. “Early-Childhood Poverty and Adult Attainment, Behavior, and Health,” Child Development, January/February 306-325. Chetty, R., Hendren, N., Kline, P., and Saez, E. 2015. The Economic Impacts of Tax Expenditures: Evidence from Spatial Variation Across the U.S., special report for the Internal Revenue Service (IRS). Holmes, N., and Berube, A. 2015. The Earned Income Tax Credit and Community Economic Stability. Brookings Institution. Avalos, A., and Alley, S. 2010. “The economic impact of the Earned Income Tax Credit (EITC) in California.” California Journal of Politics and Policy. Dollar Wise: The Best Practices on the Earned Income Tax Credit, U.S. Conference of Mayors, 2008. Ben-Shalom, Y., Moffitt, R., and Scholz, J. 2011. An Assessment of the Effectiveness of Anti-Poverty Programs in the United States, NBER; and The Earned Income Tax Credit at Age 30: What We Know. 2016. Brookings Institution. Nichols, A., and Rothstein, J. 2015. The Earned Income Tax Credit, NBER. Berube, A. 2006. Using the Earned Income Tax Credit to Stimulate Local Economies. Brookings Institution. New Mexico ranks 42nd in the nation on this measure. WPFP analysis of Bureau of Labor Statistics May 2015 Occupational Employment Statistics. Kaplan, G.A., and Lynch, J.W. 1997. “Editorial: Whither studies on the socioeconomic foundations of population health?” American Journal of Public Health 87(9): 1409-1411. Rigby, E., and Hatch, M.E. 2016. “Incorporating Economic Policy into a ‘Health-In-All-Policies’ Agenda,” Health Affairs 35(11): 2044-2052. Hoynes, H.W., Miller, D.L., and Simon, D. 2015. “Income, the Earned Income Tax Credit, and Infant Health,” American Economic Journal: Economic Policy 7(1): 172-211. Baker, K. University of Notre Dame mimeo, 2008; and Strully, K.W., Rehkopf, D.H., and Xuan, Z. “Effects of Prenatal Poverty on Infant Health: State Earned Income Tax Credits and Birth Weight.” American Sociological Review (August 2010), 1-29. Haman, R., and Rehkopf, D.H. 2015. “Poverty, Pregnancy, and Birth Outcomes: A Study of the Earned Income Tax Credit.” Paediatr Perinat Epidemiol Sep. 29(5):444-452. Hoynes, H.W., Miller, D.L., and Simon, D. 2012. Income, The Earned Income Tax Credit, and Infant Health, NBER; and Baker, K. Do Cash Transfer Programs Improve Infant Health: Evidence from the 1993 Expansion of the Earned Income Tax Credit. University of Notre Dame. Baughman, R.A., and Duchovny, N. 2016. “State Earned Income Tax Credits and the Production of Child Health: Insurance Coverage, Utilization, and Health Status.” National Tax Journal 69(1): 103-132. Lenhart O. 2018. The effect of income on health: New evidence from Earn Income Tax Credit. Review of Economics of the Household 1-34. Muennig, P.A., Mohit, B., Wu, J., Jia, H., Rosen, Z. 2016. “Cost effectiveness of the earned income tax credit as a health policy investment.” American Journal of Preventive Medicine 51(6):874-881. Evans, W.N., and Garthwaite, C.L. 2014. “Giving Mom A Break: The Impact of Higher EITC payments on Maternal Health.” American Economic Journal: Economic Policy 6(2): 258-290. Boyd-Swan, C., Herbst, C., Ifcher, J., and Zarghamee, H. 2013. The earned income tax credit, health, and happiness. IZA Discussion Paper 7261. Baughman, R.A. 2005. “Evaluating the Impact of the Earned Income Tax Credit on Health Insurance Coverage.” National Tax Journal, 58(4): 665-84. Cebi, M., and Woodbusy, S.A. 2014. “Health insurance tax credits, the earned income tax credit, and health insurance coverage of single mothers.” Health Economics 23(5):501-503. Smeeding, T., et al. 1999. The Earned Income Tax Credit: Expectation, Knowledge, Use, and Economic and Social Mobility. Center for Policy Research: Paper 147. State Earned Income Tax Credits Help Build Opportunity for People of Color and Women. CBPP. July 2018. U.S. Census Bureau, 2017 American Community Survey Data accessed through the KIDS COUNT Data Center. Talk Poverty data by state, New Mexico, 2018 https://talkpoverty.org/state-year-report/new-mexico-2018-report/. Silvis, J. Feb 2016. Six Ways the EITC Helps Kids in Schools. Get it Back Blog. http://www.eitcoutreach.org/blog/six-ways-the-eitc-helps-kids-in-schools/. Cebi, M., and Woodbusy, S.A. 2014. “Health insurance tax credits, the earned income tax credit, and health insurance coverage of single mothers.” Health Economics. 23(5):501-503. Neumark, D., and Shirley, P. 2017. The Long-Run Effects of the Earn Income Tax Credit on Women’s Earnings. NBER. Working Paper No. 24114. (Issued Dec 2017 and revised May 2018). Bastin, J. April 2016. The Rise of Working Mothers and the 1975 Earned Income Tax Credit. Thesis, University of Michigan. Povich, D., Roberts, B., and Mather, M. 2014. Low-Income Working Mothers and State Policy: Investing for a Better Economic Future, WPFP. Testimony of Nina Olson, IRS National Taxpayer Advocate, before U.S. House Appropriations Subcommittee on Financial Services and General Government, February 26, 2014, p. 32. Holtzblatt, J., and McCubbin, J. “Issues Affecting Low-Income Filers” in The Crisis in Tax Administration, by Aaron, H., and Slemrod, J., Brookings Institution Press, November 2002; and Liebman, J. November 1995. “Noncompliance and the EITC: Taxpayer Error or Taxpayer Fraud.” Harvard University. Department of the Treasury, Agency Financial Report (AFR), fiscal year 2013, p. 207. It is estimated 70 percent of issues relate to complex residency and relationship requirements and confusion on claiming eligible children. The remaining 30 percent of EITC improper payments stem from verification of wage and self-employment income. (EITC recipients are as likely to be self-employed as other taxpayers.) Income verification issues regarding self-employment are a concern in the tax code as a whole, not unique to the EITC. Testimony of John A. Koskinen, IRS Commissioner, before US House Ways and Means Subcommittee on Oversight, February 5, 2014. Based on IRS audits of EITC claims in the IRS study, “Compliance Estimates for the Earned Income Tax Credit Claimed on 2006-2008 Returns,” as reported in Estimated Earned Income Tax Credit Annual Overclaims, by the CBPP. Tax Gap for Tax Year 2006: Overview. IRS. January 6, 2012. ese figures, which are for 2006 tax returns, represent the estimated impact of business under-reporting in the personal income tax; they do not include under-reporting or other sources of error in the corporate income tax. Greenstein, R., Wancheck, J., and Marr, C. April 2014. Reducing Overpayments in the Earned Income Tax Credit. CBPP. NM Voices for Children analysis of 2015 IRS income tax data provided by the Brookings Institution. EITC Interactive: User Guide and Data Dictionary. Brookings Institution, 2015. Marr, C., Huang, C.C., Murray, C., and Sherman, S. 2016. Strengthening the EITC for Childless Workers Would Promote Work and Reduce Poverty. CBPP. NM Voices for Children analysis of 2013 IRS tax data provided by Brookings Institution. Holt, S. 2015. Periodic Payment of the Earned Income Tax Credit Revisited. Brookings Institution. Bellisle, D., and Marzahl, D. 2015. Restructuring the EITC: A Credit for the Modern Worker. Center for Economic Progress.